This entry was posted on January 28, 2019 at 6:51 am and is filed under central park, Midtown, Music, art, theater, Transit. You can follow any responses to this entry through the RSS 2.0 feed. You can leave a response, or trackback from your own site. 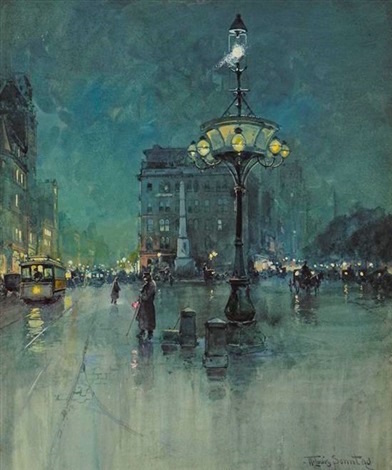 Painting captures misty shadowy rainfall contrasted with the plate glass like reflective pavement. The recent renovation of C.C. is well done. Now if only the skate boarders could be banished. I haven’t been up there in a while but I do recall all the skateboarders…. This looks more like the Worth Monument at Madison Square Park? This is the Worth Monument at 25th near Madison Square Park, not the Columbus Circle Monument. Thank you—a correction is coming. I should have known but the cable/trolley cars look so much like the ones coming down Broadway at 59th Street…and the painting was mislabeled. I should have recognized that. I spent years 1960/70/80s prowling the seats and walkways of Mad Sq Park that the trolley car threw me.Thanks AdamB. I used to work on 18th and Fifth, and later on 28th and Broadway so I walked past here many times. I love this city, and this website. Among his writings about Sonntag, in 1919 author Theodore Dreiser published a profile called ‘W.L.S.’ of his good friend Sonntag, in a book called “Twelve Men”. In it he alludes to this painting.